The Għaqda Armar Festa San Ġorġ, a branch within the La Stella Philharmonic Society, in collaboration with the management of the Teatru Astra, will be the proud host of Miliedfest - The La Stella Grand Christmas Show, to be staged at the Teatru Astra on Saturday, December 22 at 8.00pm. The show features the La Stella Philharmonic Band, St George’s Basilica’s renowned Laudate Pueri choir, Centre Stage Dance Academy, The Power House, Dance Cradle and the La Stella Children, Youths and Adults Theatre Company. At the Miliedfest, rightly billed as Gozo’s exclusive music, dance, lights and drama extravaganza this holiday season, the audience shall experience the popular blend of Christmas entertainment, with dazzling actors, radiant dancers, lavish lights and costumes, and evoking Christmas music, a seamless transition from an up-beat dance routine to a choral rendition of a Christmas carol. In a nutshell, the 90-minute revue combines music, dance, drama and humour with traditional Christmas scenes in spectacular stage settings. 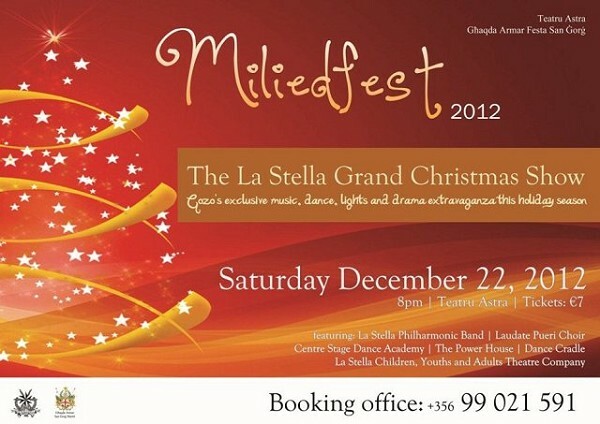 Booking for Miliedfest - The La Stella Grand Christmas Show is essential and is now open at the Teatru Astra box office, open daily between 7.00am and 10.00pm, or by phoning on 99 021 591.